Work with colors and shapes while you discover and create with this creative table from Playschool. Celebrate, spin, stack, sort, and explore. With its spinning gears and bright easy-to-hold connecting pieces, the Clipo Creativity Table system is a platform for imagination and fun. 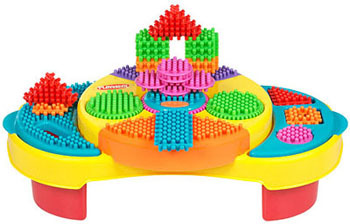 At this all-in-one play station, toddlers can develop their fine motor skills while enjoying a shape sorter and a drop slot. Spinning work areas let kids display their shapes on the table or remove for stand-alone fun. Toddlers express their curiosity as they design their own creations again and again. When playtime is over, the Clipo parts can be stored in the convenient side-storage compartments. Includes table base, two storage buckets, two peg plates, two lids, a gear unit, and twenty-five Clipo pieces.